Over the last couple of years Cleveland has really done a lot to change outsiders’ perception of the city. No longer is the city referred to as the ‘Mistake on the Lake’. In fact, recently I was on an Amtrak train traveling from Washington DC to Baltimore, and in the seat pocket was “The National”, Amtrak’s onboard magazine. And on the front cover of the National was a gorgeous plate of food and the caption “Next Stop: Cleveland – A booming food scene is helping this postindustrial city shake off the rust”. The six-page cover story featured Cleveland’s hippest neighborhoods, celebrity chefs and their restaurants. After reading the article, I thought to myself, Cleveland really has a lot going for it – exceptional museums, cool neighborhoods, world class healthcare, it has the 2nd largest theater district in the country, stellar higher educational institutions, home of big budget film productions and a championship sports team. And on top of all that, Cleveland is becoming known for making real advances in green technology. Cleveland, like most metropolitan cities has its environmental issues, whether that be runoff from urban fields or commercial sites contaminated by prior use or contaminated sediments at the bottom of Lake Erie. Cleveland is starting to find unique solutions for these issues. One of the region’s greatest assets is the Great Lakes, which provide freshwater for drinking, transportation, power and recreation. And 21% of the world’s supply of freshwater comes from the Great Lakes. So, I am happy that the U.S Army Corps of Engineers (ACE) and the Ohio EPA are working together to find a better solution for where to put the sediment dredged from Lake Erie, a solution that does not include dumping the sediment back into Lake Erie. Recently, it was reported that they are exploring the solution that the Port of Cleveland is using to re-purpose sediment. The Port contracts with a supplier that recycles the dredged sediment and uses some to restore wetlands near the harbors being dredged and sells some of the clean sediment to construction companies to use on their sites. Re-purposing prevented the need to build a containment dike, thus saving the Port of Cleveland $150 million. 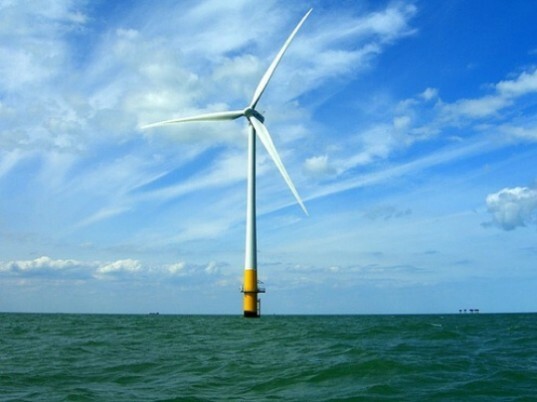 Another green technology project in development is the placing of six (6) 3.45-megawatt wind turbines eight miles off the shore of Lake Erie. The goal of putting wind turbines in Lake Erie is to funnel renewable energy into Cleveland’s Public Power infrastructure, enough to generate energy to power 7,000 homes. Initiatives like these are exciting to see as they build on Cleveland’s strong science and technology competency and continues to diversify the area’s economy. A diversified economy attracts diverse talent from all over the world. The need for more talent can help to increase the area’s population and ultimately increases the need for housing, retail and infrastructure development. All of which are things needed for a thriving city. It’s nice to see ‘Growth on the Lake’.